Brandon doesn't have any major sensory issues that cause meltdowns. The one thing is potentially meltdown inducing is crowds of people - even a small family gathering in our home - really overstimulates him and makes him upset. I realized today that Brandon is very movement seeking. I knew he could never sit still, but I never thought of it as a sensory seeking thing until just now. If you're thinking, "That's not autism. He's just all boy." Don't. Yes, it is true that lots of boys have a hard time sitting still. With Brandon, though, it's on a different level. If you spend a significant amount of time around him you will understand. Anyway, I came to this epiphany today when reading a quote by an author named Alan Yau. He said, "Bounce. 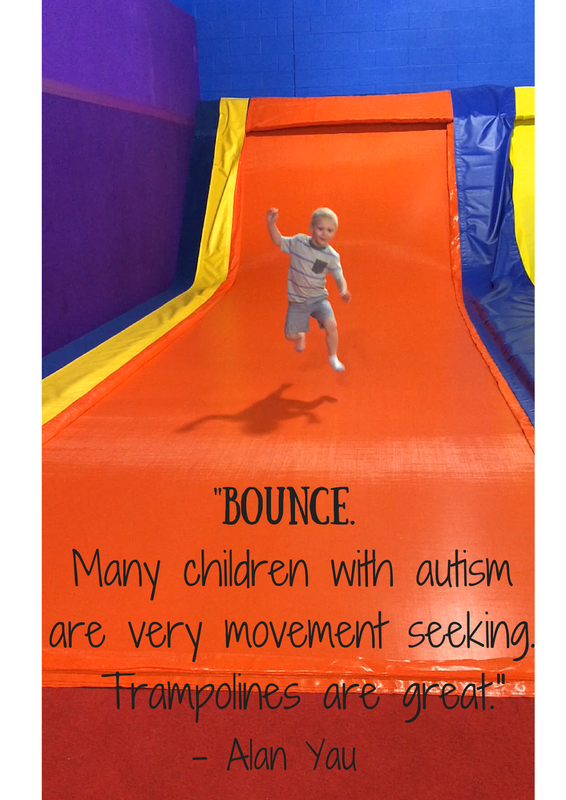 Many children with autism are very movement seeking. Trampolines are great." I had never hear the term "movement seeker" before. Okay, so what? All I've done is put a name to something Brandon's been doing all along. It doesn't really change anything right now. The significance is that I have a way to explain some of his behaviors to his teachers as he approaches school-age. More importantly it will allow for a greater understanding of why he does some of the things he does and how we can allow him the sensory input he needs, while still maintaining a quality education to the maximum extent possible. My mind is a-whirling about some movement supports and accommodation ideas to help him meet that need in the future without being disruptive. Any other movement seeking folks out there, please feel free to give me some ideas! We got my son a mini trampoline for his birthday and use it every morning before he leaves for preschool (to be honest, both of my boys get on it!) and it has done wonders. My sister also got him a foam pogo stick, which has also been a hit. I also like to youtube videos to do with him…kid's animal exercises and his new favorite Cosmic kids yoga! We have a mini trampoline, but I should probably put it in our living room so he uses it every morning. Those ideas sound amazing! I'm about to google foam pogo sticks. Could you share some of those YouTube video links with me? This is the pogo stick. It took a little while for him to get the hang of it, but after we all took turns and gave it a try (it's a crazy house here after dinner :) he got the hang of it! How have I never seen one of these things before!? Thank you!! And here is the yoga he likes to do…I've tried a ton and even bought a couple, but this is the only one that keeps his attention. They are usually around 15 minutes (he never attends the whole time but for the most part) and she makes it into really cute stories for them! Last one I swear lol! Declan's OT introduced us to this and we have one at home and at my in-laws because they have a big open floor plan with hard wood. These scooters are so fun :) They can sit on it or even better…lay on their belly and push with their hands. Ok, I'm done bombarding you with this stuff! I've hit the advice jackpot! Thank you!! How old is your son? hahaha I'm sorry! I got a little over excited about this stuff because our whole day is a TON of movement. Declan just turned 5 in February. Aw, I'm so glad!! I just ordered the pogo stick. I will post a video or photo once I can show him how to use it! Seriously, post as much as you can/want to of stuff like this. I LOVE it! Thank you!! We have a mini trampoline that is portable and we love it. We take it traveling with us and he uses it when he needs movement or is feeling overwhelmed. It has been a terrific tool!